A CUPCAKE!! July's WOTM is just the cutest ... and it is the first three-piece warmer that Scentsy has made. 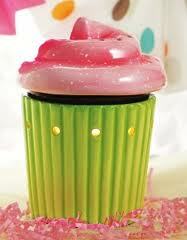 With my birthday coming up in August, you just know this cupcake warmer will be used for the rest of the summer! July's scent of the month is appropriately named Happy Birthday. Have you ever inhaled deep while taking a bite of cake with vanilla icing? That's what Happy Birthday smells like to me! It has a really sweet-like-icing fragrance ... and with me being on this diet, it just about killed me when I opened the box. It's amazing I haven't broke down and ate a cupcake, or 12! LOL! So, for the month of July only, the cupcake warmer and Happy Birthday scent are 10% off! Visit http://catscorner.scentsy.us/ to view the catalog and place your order. Everyone have a safe and scentsational summer!